Google has done it again with its Google Labs. 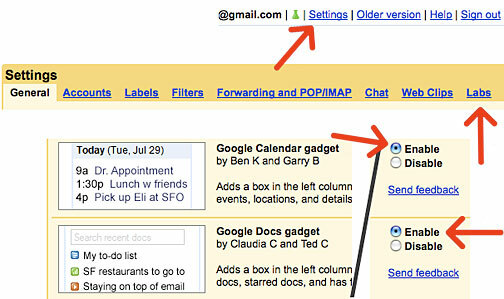 They have enabled you to see your Google Calendar and Documents all within the Gmail email page. The “Gadgets” make it much easier than going to each separate page to view your Calendar or Documents. 2. Click “Settings”, upper right. 3. Click “Labs” under Settings. 4. Scroll down to Google Calendar Gadget and Google Docs Gadget, enable both. Now your Calendar and Docs will show up as a pane just like your Email, Contacts, and Chat.